Sometimes you just need an easy and quick dinner. In our family, pizza is always a hit. I used to work in a commercial kitchen and pizza was my focus. I loved creating specialty pizzas using just a handful of proteins and some fresh veggies. 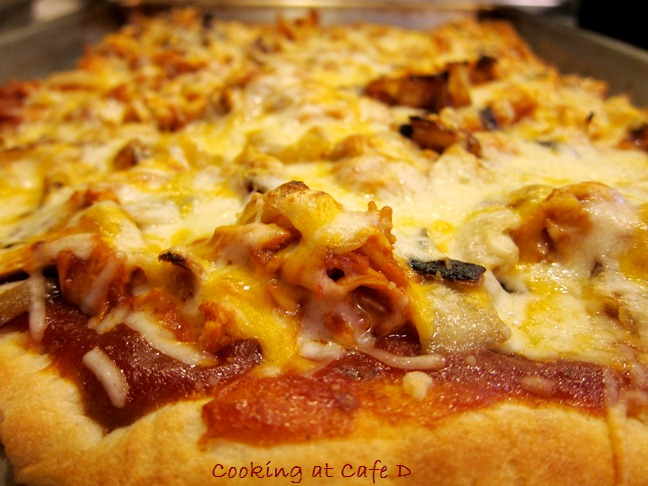 This pizza uses some leftovers from our Pulled Pork. When I make something from our Low, Slow and So Worth It! Series, I try to freeze some. I organized our food storage containers! This recipe is a cheat. I used some Pillsbury Pizza Dough. If you have the time and desire, homemade dough would be great here. Our family was completely satisfied having a pizza dinner in 30 minutes - less time than it would have take to call for delivery. Heat oven to 400°F. In a cast-iron skillet, fry the onions medium-high heat 5 to 7 minutes till brown and a even a bit crispy. Lightly oil or spray large cookie sheet with cooking spray. While the onions cook, unroll dough on the sheet and press into a rectangle - form a slight rim on edge. Bake 8 minutes. Spread the BBQ sauce just to rim of the crust; sprinkle with Romano cheese. Top with pork and onions. Top with mozzarella and cheddar cheeses. Bake 8 to 10 minutes until cheeses are melted and browned.